Akoonu, Inc.™ announced today a prestigious line-up of enterprise sales talent recently added to the Executive Team, Board of Directors and Advisory Board to support expanding the company’s go-to-market efforts and thought leadership position in the emerging market of Account-Based Selling solutions. Akoonu’s unique, buyer-aware approach to Account-Based Selling unites these thought leaders in their support for the company. With 93% of companies citing Account-based Marketing as important (Sirius Decisions, 2017), investments in marketing aim to align with sales organizations to identify the buyers that drive purchase decisions in accounts. For Sales to leverage these investments, the CRM needs to adapt to the needs of Account-Based Sales, including increased understanding of collective and individual buyer behavior and support for the complex sales processes needed to win deals. 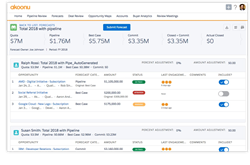 Building on the strength of Salesforce as a platform for CRM data governance, Akoonu for Sales offers the first, buyer aware platform for Account-Based Selling including modules specifically designed for Opportunity and Pipeline Management, Deal Reviews and Forecasting in complex sales. Akoonu, Inc. harnesses the power of data science in its flagship SaaS product, Akoonu for Sales, giving B2B Sales organizations a practical, cost-effective solution to the challenges of increasing sales effectiveness while reducing time spent training sales representatives and sales managers. Designed for Sales organizations that rely on Salesforce and execute complex sales in accounts with multiple buyers involved in the buying process, Akoonu integrates buyer signals from multiple sources to deliver new, buyer-aware applications for Opportunity Management, Pipeline and Deal Reviews and Forecasting. Sales Executives, Managers and Account Executives leverage Akoonu’s data science applied to historical buying patterns in winning deals to focus strategy, resources and action planning to increase close rates. Akoonu for Sales also gives Sales Executives and Managers the ability to conduct rapid, fact-based assessments of deal status and buyer engagement as part of forecast generation, conduct more productive Pipeline and Deal Review meetings and reduce time spent on data entry and reporting for sales representatives and managers. Founded in 2014 by veteran enterprise software executives to reinvent complex selling practices in the digital age, Akoonu arms companies with buyer-aware Account-Based Selling on Salesforce® to master their revenue journeys. For more information, visit http://www.akoonu.com. Salesforce, Salesforce App Cloud, and others are trademarks of salesforce.com, inc., and are used here with permission.